What happened on November 25 in the Kerch Strait is an obvious act of military aggression, and this fact is clear even to Russians. The international community’s response to Russia’s aggression has been unequivocal, and Putin has found himself unable to convince anyone outside of Russia otherwise. The Kremlin may resort, therefore, to new provocations in order to divert attention from the clash in the Sea of ​​Azov. This was the opinion expressed in an interview with Krym.Realii of Leonid Polyakov, the former Deputy Minister of Defense of Ukraine, Chairman of the Expert Council of the Center for Army, Conversion and Disarmament Studies (CACDS). “Of course, the Russian government usually starts blaming the victim for its own actions, here, Ukraine. However, in this case, Russia was faced with a somewhat unusual situation. The fact is that outside the Russian information space, the Kremlin is unable to paint Russia’s position in a positive light. No member of the international community has put forward a single argument in defense of Russia. Even Moscow’s agents of influence are mainly engaged in questioning the actions of Ukraine, but they have not defended the Russian position. Kremlin commentators are also trying to avoid discussing Russia’s actions. And therefore I am sure that Moscow will try as soon as possible to switch attention to something else,” Polyakov believes. Leonid Polyakov puts forward several hypotheses as to possible diversionary actions the Kremlin may undertake. “Coming up in Istanbul is a meeting of the Ecumenical Patriarchate and it’s expected that major decisions will be made there regarding the process of autocephaly of the Ukrainian Orthodox Church. It’s likely that opposition from pro-Moscow clerics and their associated FSB agents will intensify. Whether this aggravation will occur now or in the future is unknown, but it will probably happen sooner or later. In any case, such an aggravation will be only one of the elements of Russia’s overall efforts to destabilize Ukraine on the eve of 2019 elections, efforts which will be carried out in one manner or another. Frankly, these efforts are already under way. The only question is, what pressure tactics will occur in the near term, and which will come later,” the military analyst said confidently. The second potential area of destabilization, according to Leonid Polyakov, may be an escalation in Donbas, the industrial region of Eastern Ukraine bordering with Russia that Russia-backed forces have occupied and declared “separatist republics” since 2014. “If this happens, it can occur along with other measures. The FSB loves to combine tactics. It’s a feature they inherited from the KGB. It’s worth noting that Putin won’t necessarily do something connected with Ukraine. It may be something in Syria, because there’s money there, in Africa (money and diamonds), in the Arctic, etc. What’s being prepared for Ukraine, we can only guess, but we must be ready for anything. It is important not to forget about Transnistria. Also, experience has shown that the presence of agents of Moscow in radical circles in Poland and Hungary have already tried to conduct provocations in Ukraine. In short, there may be many options for destabilization in order to divert our attention, including even in Belarus,” argues Polyakov. As for the immediate concern about the ongoing incident in the Kerch Strait, the former Deputy Minister of Defense of Ukraine does not rule out that this too may have been done to divert attention from some other Kremlin adventure. “Remember, even before 2014 Russian border guards did not refrain from using weapons. Since Ukraine’s independence, more than 10 Ukrainian smugglers were shot dead at the border before the 2014 war. Russians have always acted much tougher than the Ukrainians. But in the Kerch Strait, they truly surpassed themselves, and, judging by the intercepted radio traffic, it is clear that the commanders of the Russian ships were very nervous. If we add to this the use of helicopters, it is obvious that they were directed “from the top. It’s clear they were ordered to commit an obvious violation. At the same time, they posted a video on the Internet showing the Russians ramming into the Ukrainian ship, proving that Russia had been intent on committing its acts without any provocation on the part of the Ukrainians. These materials can be used for the International Court at The Hague. And I still haven’t seen an explanation as to why they did it. 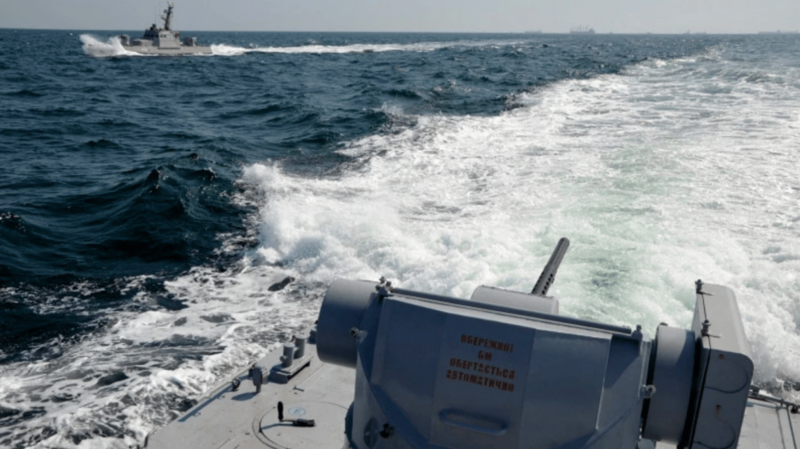 There was clearly something else there … It could be that Russia wants to provoke a breach of the 2003 agreement on the joint use of the Sea of ​​Azov, which contains a clause guaranteeing unimpeded passage of Ukrainian ships. Perhaps Putin’s goal was to cause a confrontation with the EU and NATO for purely “domestic consumption,” the expert suggests. Also, the military analyst does not exclude further Russian provocations from occupied Crimea in the Black Sea. “The British have recently announced that they are planning to increase their presence in Odesa. There are also plans to expand the NATO naval base in Romania. I wouldn’t exclude the possibility that the purpose of the Russian provocation was to intimidate NATO countries and the EU with the specter of conflicts in the Black Sea, so that they avoid entering its waters. Perhaps in this way Moscow hopes to prevent the expansion of NATO’s presence in the Black Sea region,” Polyakov suggests. At the same time, the military expert is certain that martial law under the current circumstances was the right decision for Ukraine, and it would concern primarily Ukrainian law enforcement agencies and civilians. “The declaration of martial law has never been introduced in Ukraine, and its introduction will give us at least an opportunity to work out how this mechanism should work. In 2014, it was not introduced precisely because the system didn’t seem ready for this, and martial law hadn’t been prescribed by law. Now the law exists, and for a country at war, it is important in practice to work out its implementation, so that in the event of an escalation in aggression, we would be fully prepared. As for civil liberties, take, for example, Russia-occupied Crimea. There no formal martial law has been declared, yet denial of civil liberties in Crimea is much worse than in Ukraine, which has been in a de facto state of war,” concluded the expert. Сербсько-косовський вузол: розв’язати чи затягнути ще більше?